Kenny Powers Plays College Baseball Right Now? 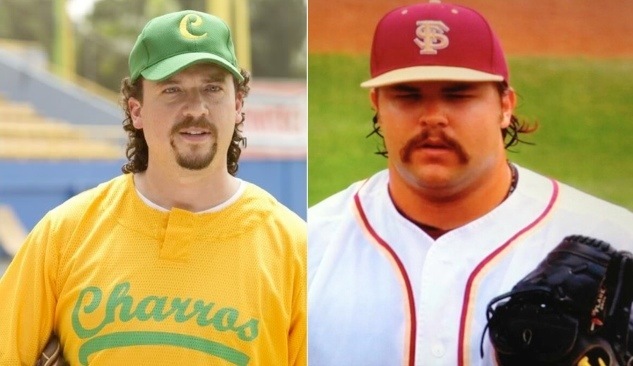 Is that Kenny Powers suiting up for the Florida State Seminoles baseball team? We’d like to think so, but it’s actually first-team All-ACC pitcher Scott Sitz. Not only does “Lunchbox” have a rocking mustache, but he also has a rocket arm. Sitz will be leading the Noles into the postseason tournament on the back of his 9-1 record and 1.66 ERA (via CollegeSplits.com). This entry was posted in Sports and tagged FSU, Funny, Kenny Powers. Bookmark the permalink.